Amaan Akhtar has a lot to say about coffee - particularly at the Edinburgh Coffee Festival! In this detailed review, Amaan describes his experience tasting various drinks and attending talks at this year’s event. We hope you’re inspired to go next year and get some top coffee tips for before then! Edinburgh is arguably the cultural capital of Scotland, boasting a wide variety of festivals, tours, and attractions. The sheer range of things on offer in this city can make it difficult to discover other lesser-known events such as the Edinburgh Coffee Festival: an annually-held event where coffee-lovers and professionals in this industry alike come to mutually share their passion and knowledge about the world of coffee. I was fortunate to attend the festival this year on the 6th of October, and I was amazed by the rich and insightful experience I had. Having been a couple of years ago myself, this event was initially held in a small part of Summerhall in Edinburgh and has now recently expanded into The Corn Exchange, following their past success – to allow for further additions in their event programme as well as for many more exhibitors to get involved in the festival. So, naturally, as a coffee lover myself, I was fascinated about the new changes they had brought to the schedule this year. After arriving early with my girlfriend to the venue, we (as expected) encountered an overwhelming array of exhibition stands that were sprawled across the ground floor of the venue, with a stage overlooking it where the ‘Scottish Aeropress Championships’ tournament would take place during the course of the day. While this may be an intimidating sight and seem like a pretentious event for only coffee connoisseurs, this was not the case as even the most casual coffee or tea drinker would be welcomed amicably at this festival. As we decided to take a quick tour of what the festival had to offer, we were amazed by the diverse range of businesses proudly displaying their wares: catering companies, environmentally-friendly products, coffee accessories, roasting & filtering machines, artisan coffee makers, tea specialists, bakers, chocolatiers, hot chocolate, and superfood lattes… the list seemed endless. It truly felt like there was something for everyone. From the coffee connoisseurs who would relish their taste buds in the cupping room, to those aspiring baristas wishing to learn more in the SCA (Scottish Coffee Association) coffee skills classes, or who sought to compete in the aforementioned Aeropress tournament. Or even those who just enjoy a delicious hot beverage, and simply wanted to gain a new perspective on the coffee industry from the talks and demonstrations - this event had it all. It felt like a café dweller’s paradise. After taking it all in, we began our coffee-tasting journey. Coffee was offered freely from all the stalls, so naturally we sampled several different types of coffee from a selection of local independent coffee shops (Cairngorm Coffee, Brew Lab, Fortitude Coffee, Baba Budan, Obadiah Collective) that were becoming popular in the Edinburgh scene. Needless to say, we quickly developed a “buzz” for every cup of americano that graced our hands. While we enjoyed sipping on the unique flavour profiles of each cup of coffee, Brew Lab’s cold brew coffee easily won us over because of its incredible versatility. It could be enjoyed by itself, with a splash of milk, or even combined with tonic water or ginger ale. The sweet, fruity notes extracted over 24 hours made this cold drink refreshing and satisfying (especially the caffeinated hit) to have at any time of the year. When taking a closer look at the individual stalls, you quickly got the impression that you were stepping into a tight-knit community dedicated to fair trading, caring for their own people as well as the environment. For instance, coffee roasters and cafes such as Union Hand-Roasted, Dear Green, Django Coffee and many others are dedicated to ethically sourcing their coffee beans from sustainable agricultural communities around the world. And some even go beyond this measure by also ensuring that the coffee farmers themselves always receive fair, consistent prices during trade negotiations. This was further highlighted by the fact that these businesses offer full transparency on their supply chain, so that the consumer can be reassured that these high ethical standards are constantly adhered to at every stage of production. Additionally, eco-friendly brands like Vegware and Frank Green are pioneering the way forward as they offer products to help protect the environment. Vegware have an extensive range of plant-based disposable packaging that can be compostable within 12 weeks; they offer a range of drink cups, takeout boxes, and food containers that are all entirely made from recycled and renewable materials. Similarly, Frank Green’s range of smart & stylish reusable cups and bottles are made from premium, safe (BPA-free) materials and also come with a built-in coffee app that allows you to pay for your drink at any local café. The app aims to soon launch in the UK, so it is something to watch out for! And then there were family-owned businesses which exuded passion and dedication to their craft – you could not help but fall in love with them! Alchemy Cordial commit their time to producing organic, naturally-flavoured cordial and syrups. At the event they were promoting their Golden Turmeric Elixir - a blend of natural extracts from Asian crops to provide health benefits in a delicious way. Just from tasting a sip of this 15 ml drink blended into milk you could taste a smooth, creamy flavour that was well-balanced with turmeric and other spices. The Leaf & Bean Café oriented their small business towards creating a family-friendly environment – something you could observe just from talking to them. They were the kind of café who went that little extra step to make you feel comfortably warm and cosy during your stay. Thomson’s Coffee has had a rich history that started with the first shop in Glasgow back in 1841: although the brand has been passed down through different families, they have flourished while being Scotland’s oldest coffee roaster and a trusted supplier to many different establishments. Their popularity certainly hasn’t dwindled, as their stall was consistently busy with queues. While every stall had heralded from different backgrounds, each and every one of these businesses displayed true affection and love while working in the coffee trade. We then moved our taste buds over to The Real Hot Chocolate Company, who produce dairy and sugar-free hot chocolate from naturally-sourced cacao beans. After taste-testing their Chilli & Coconut Hot Chocolate, White Chocolate with Coconut, and Tonka Bean & Vanilla variations, we were instantly delighted by the powerful combination of notes which blended well with the chocolate. Needless to say, we had to buy a bag for home…. Our tour of the exhibition stalls ended with sampling many baked goods (because why wouldn’t we?). We first stopped at Cakesmiths , a business that makes and bakes a fine range of wholesale cakes (traybakes, traycakes, brownies, flapjacks, loaf cakes – you name it, they have it!) and supply coffee shops within the UK. 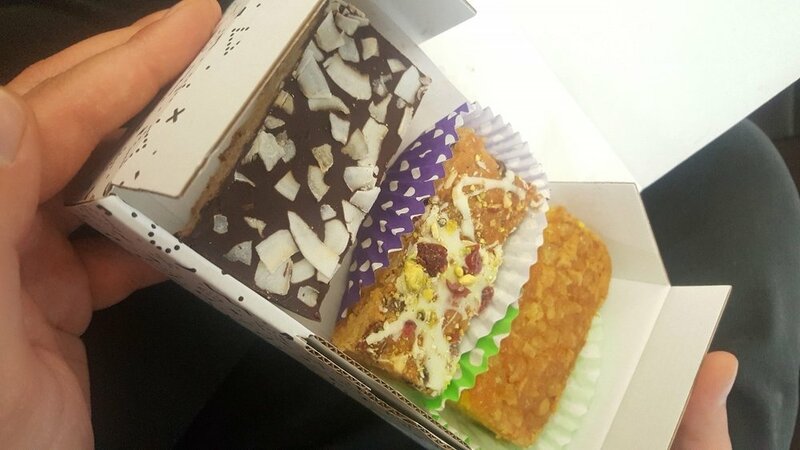 We were lucky enough to try a handful of their selection: the Christmas Frangipan traybake, Lemon, Ginger & Turmeric cake slice, and the Toasted Coconut & Dark Chocolate slice. All of them were absolutely divine with their flavours and textures, and even made us crave a taste of each and every treat in their selection. However, the little gem that stole the show for us was The Herbivore Kitchen, a vegetarian and vegan-friendly café that offered their famous signature brownies at the festival. While there were several stalls (including Cakesmiths) who offered gluten-free and vegan friendly options to cater to anyone’s dietary needs, there was something special about this particular stall. Having bought a box of 4 brownie flavours (Mint, Peanut Butter, Smoky Maple & Pecan, and Raspberry & Salted Caramel), we tucked into them in the seating area outside the venue. And. They. Were. Mind-blowing. The texture was incredibly moist, and the flavours were well-balanced with the fudgy taste of brownie. Without a doubt they were the best brownies I had ever had. While seeing all of these incredible exhibitors, we also eagerly went to some of the talks and demonstrations in-between, that were scheduled at specific times during the event. The first talk that we attended was an eye-opening experience. Esther Gibbs from Manumit Coffee opened the event for us with a discussion about fighting modern slavery. She shed light on the millions of people (including tens of thousands of individuals within the UK alone) who have been exploited and trapped by human traffickers and modern slave traders. However, their organisation works closely with and invests in anti-slavery projects to help those who managed to escape and survive such tragic circumstances. By training these survivors as coffee roasters, they offer flexible employability options – but more importantly, they provide hope and emotional support for individuals who are trying to develop a normal life away from slavery. Although we can never fully understand the horrific ordeals that these survivors of modern slavery went through, it is at least empowering to know that there are organisations like Manumit who work fiercely to make a difference in this area. Next up, we heard a talk from Lee Hall at Union Hand Roasted. He displayed an in-depth example of how their ethical policies and trade rights help sustain coffee farming communities in different regions across the world. He discussed emphatically how Union Direct Trade (the company’s philosophy for coffee sourcing) works in partnership with coffee farmers to improve both the quality of coffee and the livelihoods of these communities on a long-term basis. He also outlined how their company gets closely involved in the coffee production: they always send their employees to coffee farms around the world to provide assistance in these regions, to ensure that every stage of the process is carried out in a fair and sustainable way for everyone involved. Finally, to end the day we settled in to see a tea demonstration held by Erica Moore of Eteaket. As a leaf tea expert, she taught us some interesting facts about tea such as the fact that all types of tea originate from one plant! She demonstrated how to brew different variations of tea (including their limited edition Purple Rain Blue Tea) which the audience got to try at the end. Erica’s business is clearly passionate about tea, as their main mission is to simply help people connect and create moments through the simple joyful act of sharing a pot of whole leaf tea. Overall, as a relatively new festival, the event was an incredible and enlightening experience for us. It shifted our perspective on how the coffee industry works, and the remarkable individuals whose businesses strive to make a difference in the world. Additionally, it truly felt like we as consumers were being welcomed into the fold of this large family, as we collectively contribute and support these local and international businesses. By ensuring that the produce we buy is ethically sourced, supporting organisations who put peoples’ welfare first, and promoting sustainability in the environment, we too can help make a difference on a global scale. And something about that feels truly remarkable.